I spent a few hours looking at the conference offerings this coming fall. Something I’m used to doing and invigorated by – I’m energized by the pursuit of knowledge and no better place than a conference, a meeting of minds. Yet, this usually vitalizing activity got me very depressed. Well, it seems there is within the “leadership” (if I may use that word and ruse), there is within this speakerhood of conference presenters, a very bitter hypocrisy. I mean, so many are professing to be on the boat of humanistic teaching, of student centeredness, of being cutting edge and knowing of where the world of language teaching is going. And all this may be true. However, almost all are parading to the tune of the pied “textbook” piper. Let’s face it – the era of the textbook as we know it is dead. Yet, so many of these astute presenters are a generation born, bred and still getting their sustenance from the textbook absurdities of 12 units – speak, pronounce, vocab, read and write and you know English. It’s all packaged differently, it’s all wrapped in a million layers of “newness”, they’ll all swear their book is different but at the end of the day they are selling yesterday. What’s worse – I find nobody calling them on it. So next time you are at a conference with some veritable “name” on the stage. First, ask yourself if what they did (the textbooking they put their name upon) really has benefited students and led to learning and not dependence, to profit. Then, ask yourself if what they are saying isn’t a bit hypocritical, given their publishing record. 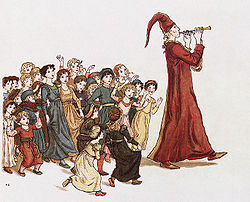 Finally, stand up and ask them this question – “if you could do it all over again, not needing money or fame and having a steady income from your inheritance, would you still dance to the tune of the pied “textbook” piper?